Sajitha De Mel, Manager-Growth and Innovations of Expolanka Freight, a member of Expolanka Holdings PLC, was awarded the Young Marketer of the Year award at the recently concluded Global Marketing Excellence Awards 2015. This was hosted by the World Marketing Congress in partnership with the CMO Asia and was held at Hotel Taj Lands End, Mumbai on 27 November. 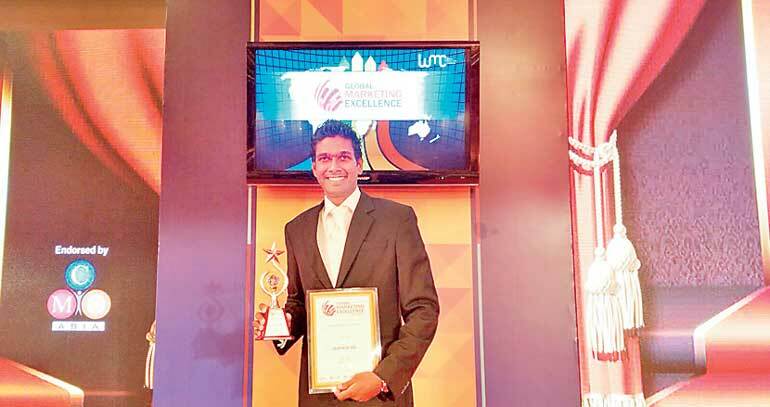 He is the first Sri Lankan to win this category award launched this year. The prestigious award for ‘Young Marketer of the Year’ is given to individuals below the age of 35 who have displayed outstanding marketing skills throughout the early stages of their careers. Speaking about this laudable achievement an elated Sajitha says, “I’m deeply humbled by this recognition by an international awarding body. My journey still lies ahead and this spurs me to achieve greater heights in Sri Lanka’s corporate world in the years to come. My sincere thanks to everyone, too numerous to mention by name, who helped me achieve this. I am indebted to them for their inspiration, support and encouragement. Sajitha’s school years and his professional life are speckled with numerous prestigious and coveted awards – he won the Young Achiever Award 2014 at the Global Brands Excellence Awards held in Singapore, Ten Outstanding Young Persons Award Sri Lanka 2010, NASCO Award 2008 and was also nominated for the Young International Freight Forwarder of the Year 2013 held in UK. Starting work as a Sales Agent at Standard Chartered Bank in 2003 at the age of 19, Sajitha continued developing his professional education hand in hand with his career. He cut teeth at handling administrative functions at HSBC; then to Sri Lanka Institute of Marketing handling customer service, moving on to freight forwarding at Dellogistics. Sajitha’s career advancement saw him recalled to a higher post at the same company after a short stint at Hemas Group. Promoted to Sales and Marketing Manager a year and half later, he left to join the Expolanka group and re-launch UCL Logistics a subsidiary of Expolanka Freight in 2008, where he was the General Manager. Currently he is the Manager – Growth and Innovations at Expolanka Freight. He is also the President for Expolanka “A” Team Management group. Sajitha is also the President of Advent Global Sports and team – Principal for Advent Rally Sport Team. His professional education continued unabated, gaining qualifications in Human Resource Management, Import-Export, Custom House Agents Examination, Shipping, International Freight Management, Dangerous Goods Handling, Logistics, International Trade and Transport. He was the youngest Lions Club President in Sri Lanka at the age of 25 to head ‘Inspire 1 million Sri Lanka project’, he was a committee member of Effies Awards 2012, he was the Secretary for Sri Lanka-America Society, Asst Secretary for Sri Lanka-UK society, Executive member Lanka-Japan Friendship Society, President Junior Chamber International Sri Lanka, Colombo South, Vice President Education-Expolanka Toastmasters Club and a Paul Harris Fellow from the Rotary Clubs International. He is a member of Young Members Forum of Ceylon Chamber of Commerce. In 2013, he was conferred the title of Certified Professional Marketer by the Asia Marketing Federation and he is an All island Justice of Peace.